Nothing is sweeter than a handwritten letter. The act of opening an ornately lined envelope only to find kind words from your grandma, mother, or friend is a treasure not soon forgotten. Create an heirloom quilt to mark milestones such as weddings and graduations, to honor those serving in the military, or to remember any special life event. A modern take on the signature quilt, Letters from Home is the ultimate love letter. 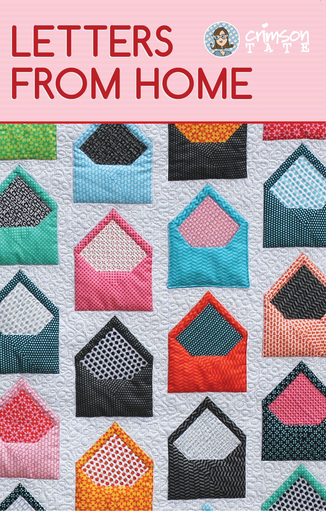 Pattern includes instructions, illustrations, and a bonus template to make envelopes into a pocket that can be filled with kisses, good wishes, and love notes. Quilt sizes scale from Crib to King. Be sure to take a peek at the corresponding Acrylic Template to aid in fussycutting the perfect envelope linings (see related products). Use of this pattern is restricted to the original purchaser, and may not be shared, copied, or distributed per copyright law. Oh man. 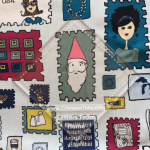 We’re honored that you have chosen to purchase a Crimson Tate Studio pattern. That’s pretty swell. We love what we do. We love the laboring over the designing of the quilts to figuring out the best way to communicate how to build it, doing all those maths, sketches, and computations. We love the trial and error and then testing, retesting, and testing again. We love deciding how to lay it out, pour tons of time and energy into the graphic design, creating charts, packaging, licking envelopes (just kidding! We don’t lick anything. The plastic sleeves are self sealing once you pull away the tab. But we do pull away the tab!) We thank you for honoring our efforts by not sharing your purchase with others. We’re humans doing our work and trying to do the best job we humanly can. Sharing files is booty and just plain not cool. Thanks for sticking with us and supporting an independent small team of real people making real things.